Looking for a comfortable, flexible and feature-laden family hauler backed by a reputation for quality and stellar resale value? The Honda Odyssey fits the bill. My great Honda odyssey. I love the space and back up camera. My 2011 Honda odyssey is the family vehicle. It fits 8 people and has lots of room. It has a back up camera which is very useful, also has a DVD player for our girls to watch while riding and they love it especially on long trips as well as do me and my husband. Also has automatic sliding side doors and back pull up door which I use a lot especially if my arms are full. We can also put down the back seats to make more room to carry groceries and such. It also has a CD player, radio, Bluetooth, GPS system, cruise control, gas lock, and a sunroof that my girls also like. All the seats are electric and has the pull handles as well, so if something went wrong with the electric part, we could still move the seats. It is also a great road vehicle. We have taken family trips to Illinois, went to Florida to get on a cruise, have went the mountains and the beach as well for family vacations and this is not to mention all the running I do as a mom of kids. I love my Honda odyssey and hope this helps anyone is considering buying one. We travel everywhere, our children are posted at different bases so we must drive. You hardly notice that the van is on and manages road deformities. When it goes over rough bumps or a pothole you don't feel a hard jilt, just a smooth insignificant bump. The only reason we did not five star it, is that the seats need to be more cozy comfort for long term deep seating. The lumbar is not great at all and the headrests are to solid and unfriendly. The armrest need to be longer, wider and more plush.Getting to the handle to lower and raise the seat is a bit difficult but still manageable. Maybe, you could add a blue floor light that you are able to turn on and off instead of the overhead lighting. This would be a great improvement along with the chair modifications the van does amazing. 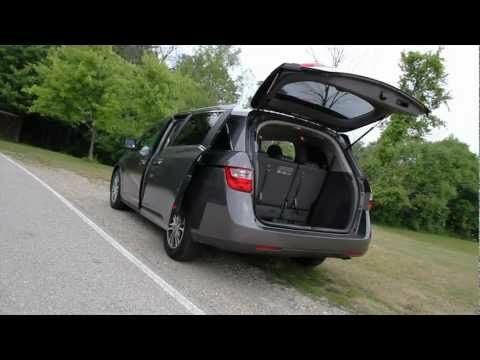 Pros and cons of the 2011 Honda Odyssey. What I like about my 2011 Honda Odyssey are the spacious interiors, the rear view camera, the user friendly dashboard, the sunroof, the rear air controls, the rear volume controls, and the very conveniently placed cup holders. However, this vehicle has about 5 safety recalls. Although we have remedied all the recalls on our vehicle, we still have issues with the automatic sliding doors (which sometimes do not open properly). We recently had to replace the motor on one of the sliding doors after the wire snapped. The doors have been the only issue with our car. Otherwise, the car drives well, and I feel safe driving my family in this vehicle. DEALERS WILL REPLACE EITHER THE PASSENGER'S AND/OR THE DRIVER'S FRONT DOOR WINDOW GLASS, FREE OF CHARGE. THE SAFETY RECALL IS EXPECTED TO BEGIN ON OR BEFORE APRIL 15, 2011. OWNERS MAY CONTACT HONDA CUSTOMER SERVICE AT 1-800-999-1009. VANTAGE MOBILITY INTERNATIONAL (VMI) IS RECALLING CERTAIN MODEL YEAR 2011, HONDA ODYSSEY NORTHSTAR AND SUMMIT MINIVANS MANUFACTURED FROM JUNE 26, 2011, THROUGH AUGUST 22, 2011, AND WITH WHEELCHAIR ACCESSIBLE CONVERSION, FOR CONTAINING 2 FAULTY FUEL LINES WITH NON-CONDUCTIVE CONNECTORS. THE NON-CONDUCTIVE LINES MAY NOT DISSIPATE THE STATIC ELECTRICITY WHICH COULD CREATE A SPARK. FUEL LEAKAGE IN THE PRESENCE OF SPARK COULD CAUSE A FIRE. VMI WILL NOTIFY OWNERS, AND DEALERS WILL INSPECT AND REPLACE THE FUEL LINES FREE OF CHARGE. THE SAFETY RECALL IS EXPECTED TO BEGIN ON OR BEFORE SEPTEMBER 23, 2011. OWNERS MAY CONTACT VMI AT 1-602-304-3265. THE WINDSHIELD WIPERS MAY FAIL TO OPERATE, DECREASING THE DRIVER'S VISIBILITY IN ADVERSE WEATHER CONDITIONS INCREASING THE RISK OF A CRASH. DEALERS WILL REPLACE THE FRONT WINDSHIELD WIPER ROD FREE OF CHARGE. THE SAFETY RECALL IS EXPECTED TO BEGIN ON OR BEFORE APRIL 14, 2011. OWNERS MAY CONTACT HONDA CUSTOMER SERVICE AT 1-800-999-1009.